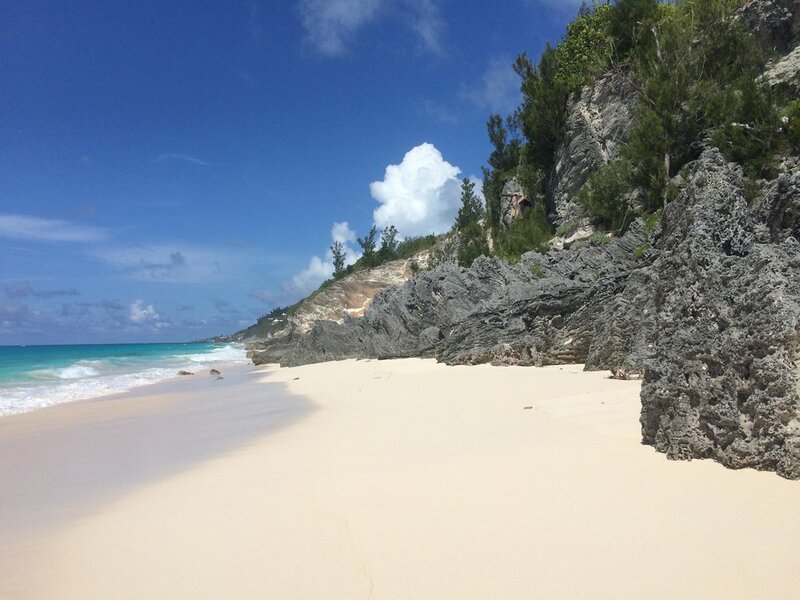 Bermuda has some magnificent large and small beaches. Some of them go on for miles and miles while others are only a few yards long. 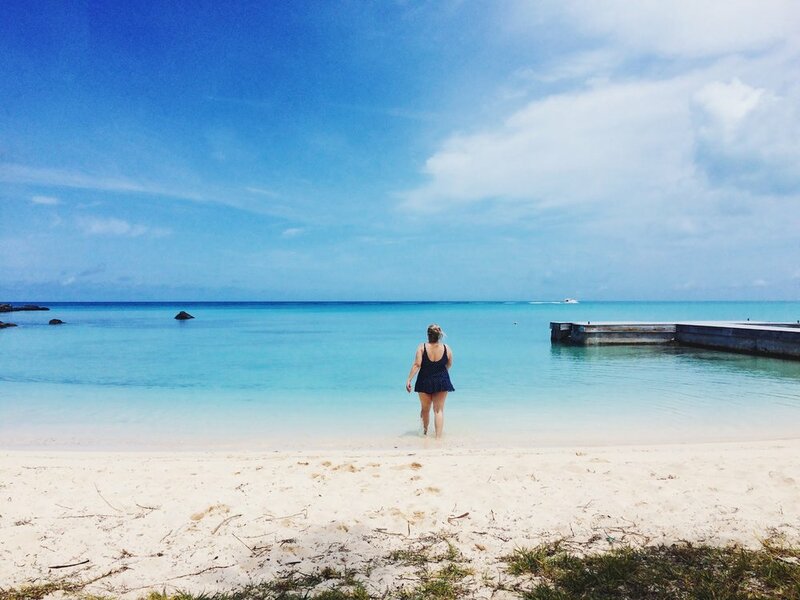 You just can't travel all the way to a fantastic tropical island without visiting a beach or three. The sand is always soft and warm. The water is always turquoise. 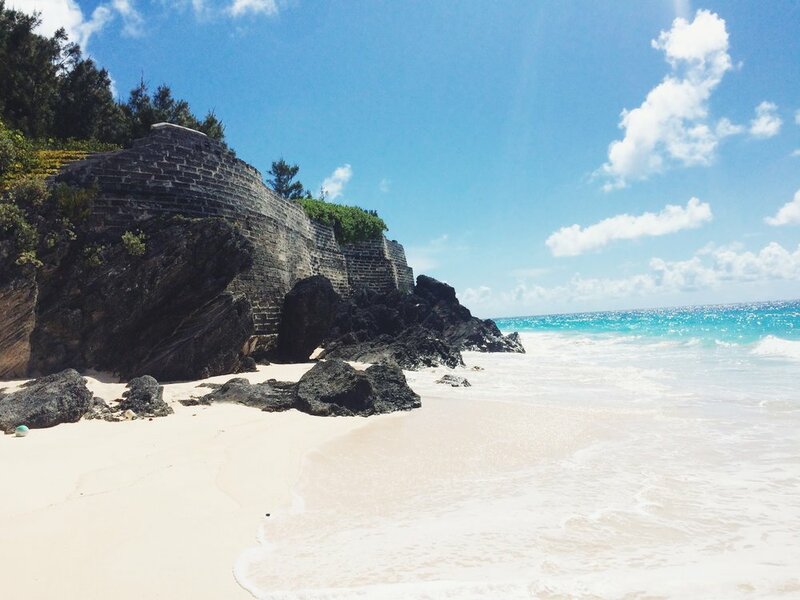 Bermuda has a whole lot of coastal beaches and all of them are fantastic. I've been to Bermuda twice. The first time was in 2015 during the Fourth of July weekend. Most of the hotels were crowded with American tourists. Of course, so were the well know beaches like Elbow Beach or Horseshoe Bay. 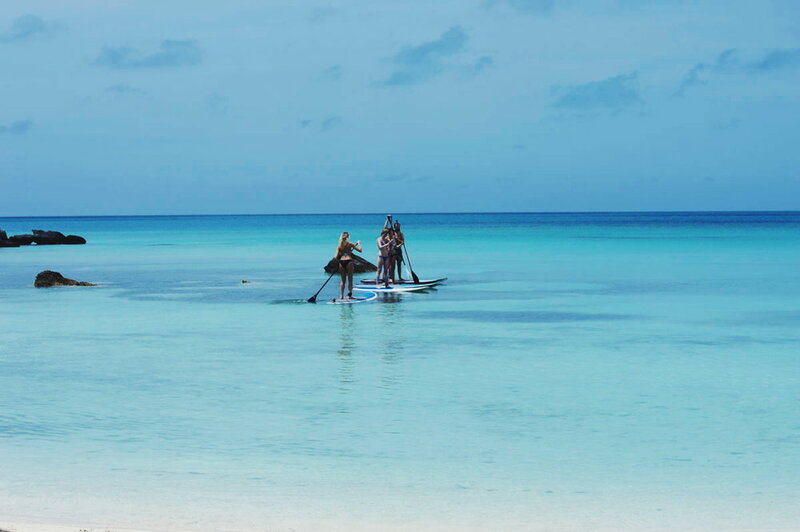 The beaches on this list are stunning and favoured by locals. A few of them are truly hidden gems that I found through poking around and paying attention while I rode my scooter around the island. 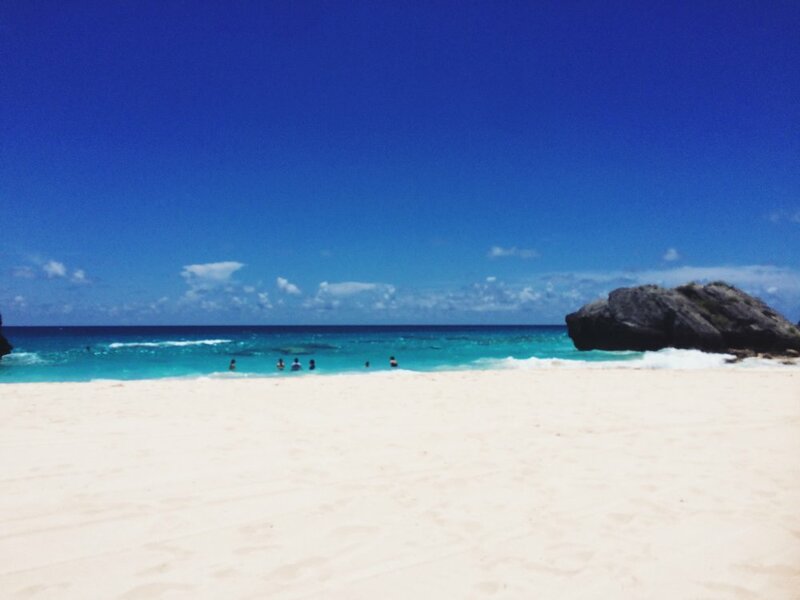 My second trip to Bermuda was a year later a week before Fourth of July. Again, it was during a high season for Bermuda. I visited the spots I found on my first trip and they proved to be just as empty and just as lovely. I'm sharing with you a bunch of spots around the island, big and small, popular and secluded. There is a combination of public and private beaches too. Marley Beach is a hidden gem. Literally. It's difficult to spot it as the entrance to the road is overgrown. It one of many beaches on the south shore of the island. It also connects to another beach on this list, Surf Side Beach. I've learned about Marley Beach while I was driving around on South Road. I saw a bunch of cars parked on the side of the road. Since it's not possible for tourists to rent a car in Bermuda - because it's illegal - I conclude that it's a popular local spot. A lot of those cars had mounts for surfboards too. If you're looking for an alternative spot to more popular places like Horseshoe Bay this is definitely one of those. I think it's interesting because it's hidden in plain view. I've included a bunch of photos of what to look for when you're on South Road. The entrance is of course from the south side and if you pass it don't sweat it. Just turn around. The entrance is right in the middle of the shaded area. Told you it was overgrown. I learned about Surf Side Beach while I was staying at a hotel nearby on my first trip. The public entrance is a small alley past a gas station. It's not hard to spot, especially compared to Marley Beach. When you get to the end of the walkway you'll walk down a flight of stairs and you'll enter the beach. It is one hell of a beautiful beach. You have three options. You can stay where you are and near the stairs. There is nothing wrong with that. It makes leaving the beach much quicker. There weren't that many people on this beach, to begin with, but this was the most trafficked part. To give you an idea, I've seen a total of maybe 15 people on this beach over the course of three days. I went to Bermuda during the high season too - the Fourth of July weekend to be specific. Option two is to turn left and go a little east. You'll see some steep stairs in the distance and a small terrace too. That's the end of the beach. The terrace is part of the Surf Side Hotel's access to the beach. This is a public beach so don't worry about anything here. Going towards the hotel will get you a little away from the public entrance if you want fewer people around. Church Bay Park is off South Road. It's further west, past Horseshoe Bay. It's a large park near a bus station. It's hard to miss it. Atop the park area, near the road, there is a large lawn with a few picnic tables. The views of the water and a few rock cliffs is really spectacular there. When I first got to Church Bay I decided to forgo the beach to read a book on the lawn instead. It was shaded which was nice. And the grass helped the ground stay cool as well. If you walk down the path you will soon be greeted with a large beach. It's the largest in this whole list. There are a lot of boulders around the beach which keeps them a bit separate. Pick an area and lay down your towel. If you're looking for a true paradise beach this one takes the cake. It's large, it's hot, it's every thing you'd expect from a tropical island in the middle of an ocean. Long Bay is actually a park with a beach attached to it. It's public. Both times that I was there I saw a giant family having a picnic. Both times I was there to watch a sun set. 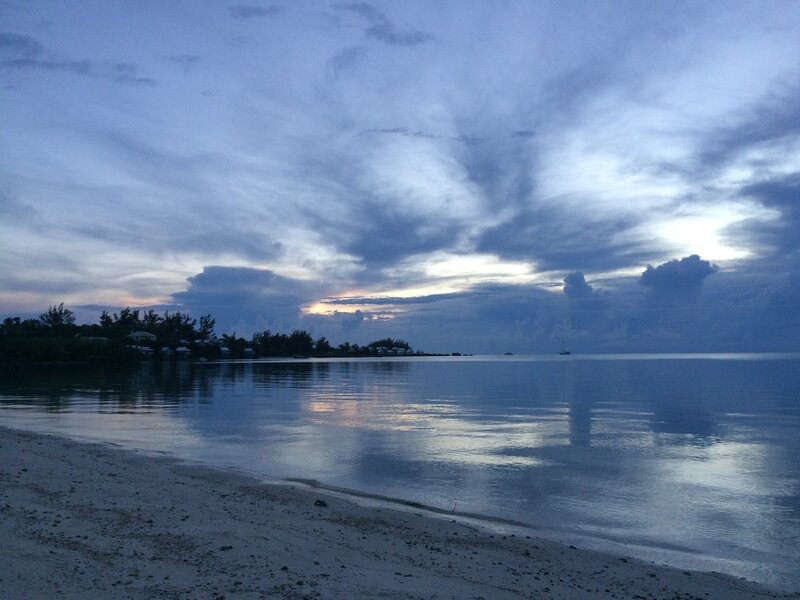 It's a great spot for both, enjoying the beach and enjoying a great sunset. I found this place because it was on my way to David's Head Beach Park were I rented paddle boards. More on that below. This whole corner of the island is pretty residential. You won't find crows of tourists around. That's why I liked it. I also really loved the sunsets. As you can see they can be very powerful and oh so beautiful! While I was in Bermuda I rented a scooter and I drove everywhere. That's how I found out about a lot of these beaches. If you take Barry read from St. Catherine's Beach you will circle back to the same areas. Berry Road itself is on the edge of the island. It provides access to so many small beach spots. Some of them are really tiny and they are all really nice. One of the spots I passed was actually a cliff that was hidden in the bushes. I marked the spot on the map below. It's again a hidden little gem with a bunch of bushes stomped out. 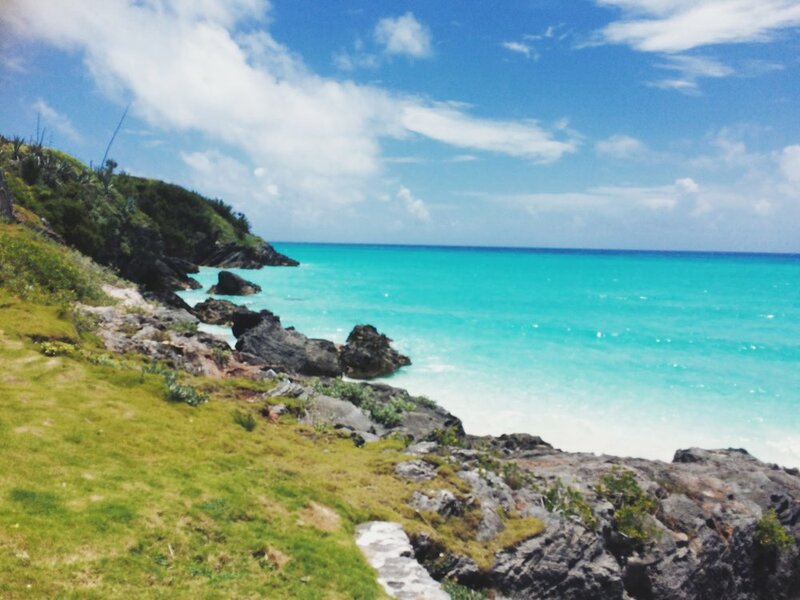 It's my second favourite spot in Bermuda. It was right across from a lengthy three way driveway. After parking my scooter, I climbed down the rocks through to dip my feed in the water. The rocks were slippery. Now, I did not go into the water from this spot. I just sat there and read my book for a good part of the hour. It was a very lovely view as you can see yourself from the photos. I didn't go in because I was scared I'd hurt myself. I was there by myself which made thing much more difficult if I did in fact needed help. I didn't want to risk it. 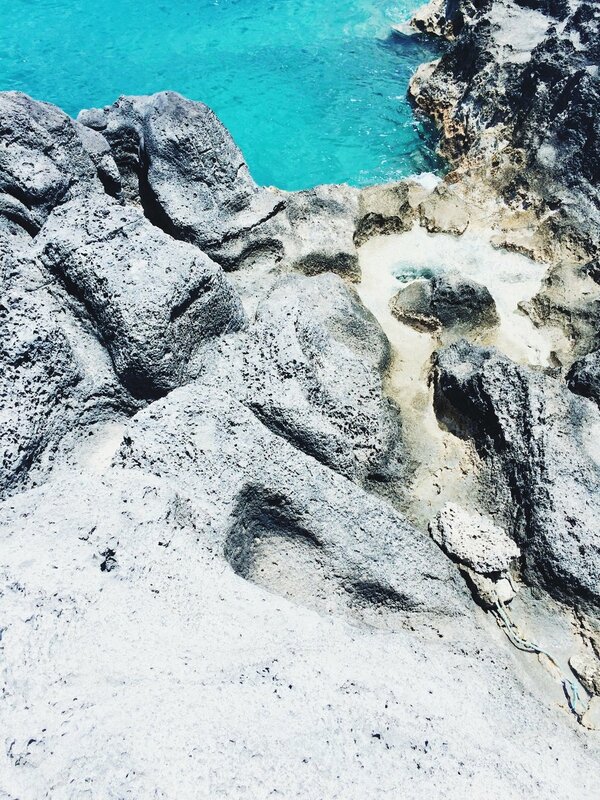 This is my third favourite spot in Bermuda. It's a large beach tucked away in the corner of the island. The locals seemed to enjoy it a whole lot. The first beach area is by the parking are. There are people there with kayaks and water bikes. They might be for rent, I don't know. You might be able to borrow them from the locals if not, though. You never know. The second beach area is further back near the rocks. There used to be a bungalow hotel there once. It's been abandoned since. I presume that there was a hurricane that damaged them tremendously and the owners did not want to renew. But that's just me guessing; I have no idea what actually happened to them. You can see a couple of them on the last photo. You can see some of the bungalows by the Daniel's Head Beach. Oh, there is a boardwalk by the beach and a couple of palm trees to set up a hammock. I first learned about Daniel's Head because I booked an hour of paddle boarding from SurfSup Bermuda. It was a locally run shop by two lovely people. I learned that they had to close down the shop just now because of lack of business. 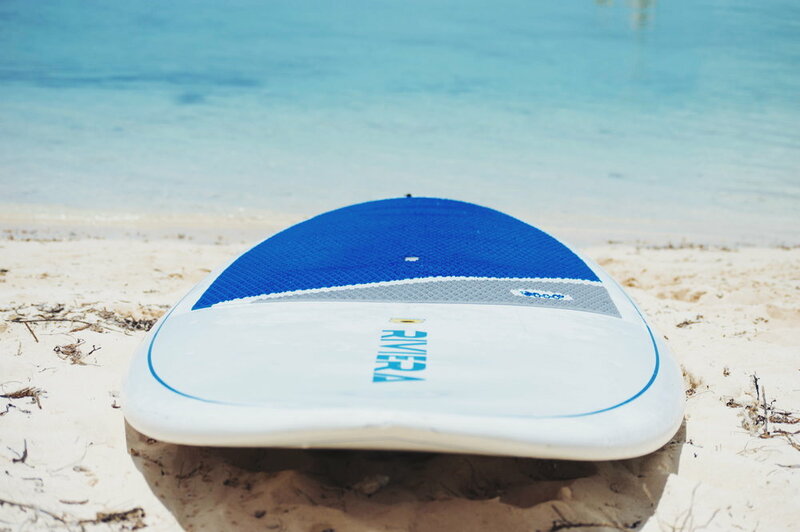 That made me sad because paddle boarding and hanging out at Daniel's Head Beach were a big highlight for both of my trips to Bermuda. I did enjoy paddle boarding in the bay so much. I got to see turtles, as well as admire the landscapes from the water. My second time there I went towards the rocks and I go to see Daniel's Island up close. It was really great. It's a shame that the shop is closed but it's still a great beach getaway if you're looking for one. During my second time in Bermuda, I stayed at a privet residence off Pompano Road. The woman who was our host told us that there is a beach through the Port Royal golf course that we can go to without causing trouble. This beach is still private property but is not part of the golf course. She informed us that we can go there and not be bothered nor would we be a bother to anyone else for that matter. When I went to check it out the buildings were empty. She made it seem like the neighbors had a deal with the property owners. Either way, it was such a lovely spot. I'm sure it made for a fantastic sunset spot; it did face west. The beach was tiny - and a little dirty too. I do recommend checking it out if you're staying in the Southampton Parish area. Pompano Beach Club is actually a hotel. Their beach is private to their guest and they do kick people out who are not guests. I found two ways in which you can enjoy their beach without staying at their hotel. First, you can rent their water equipment like kayaks or paddle boards. They advertise many activities on their website. If you rent from them, you then become a paying customer and are welcome to use the beach. Of course, if you are a guest you can enjoy the beach at any time. The hotel itself is lovely so if you can afford it, go for it. It is a 4-star hotel that was a bit outside of my price range. It has plenty of amenities to cover all your needs. The second way is to buy a drink. I went down to the hotel shortly after getting settled in my rented apartment. It was, after all, down the street from where I was staying so I went to check it out. I ordered a drink at the bar and sat on the terrace and watched the waves crash on the beach. No one said anything to me while I was there. After i finished my drink I took a stroll on the beach. No one seemed to be bothered by me.